A real show-stopper that's quick and easy to cook up, whatever the occasion. Place beef mince, soy, garlic, ginger and panko crumbs in a large bowl and mix until combined. Roll into 24 meatballs, about 1 tablespoon each. Soak bamboo skewers in water for 10 minutes, drain and closely thread 3 meatballs onto each skewer. Place chopped vegetables in a large heatproof bowl. Place rice vinegar, a pinch of salt flakes and 2 sprigs of rosemary in a small saucepan and bring to a simmer. Turn off heat and pour vinegar over vegetables, turn to coat and cover with a lid. Leave to pickle for 5-10 minutes for crunchy pickles. Drain before serving. Combine glaze ingredients in a bowl and use remaining 2 rosemary sprigs for brushing glaze onto meatballs after cooking. Drizzle meatballs with a little oil or oil spray and then place on a preheated BBQ or fry pan on medium to high heat, cover and cook for 5 minutes then turn over and cook for another 5 minutes. Brush meatballs with glaze using the rosemary skewers while on the BBQ and brush again with extra glaze to serve. Cook soba noodles according to packet directions, drain. 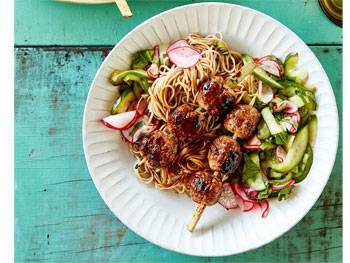 Serve skewers with pickled vegetables and soba noodles. When turning meatballs on the BBQ, use a palette knife or metal spatula as they have a tendency to stick and the bamboo skewers will be hot. Meatballs can be made ahead and frozen. Bake from frozen at 180°C fan forced for 15-20 minutes. Glaze in final 5 minutes. Try with lamb or veal mince.